All hail the latest trending ingredient: seawater. 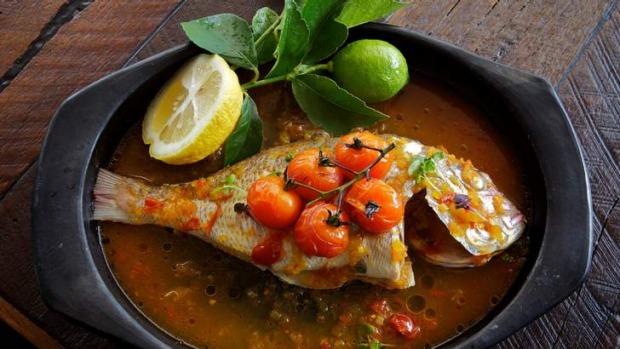 Southern Italians maintain that to make a genuine pesce all'acqua pazza (fish in ''crazy water''), the broth must be made with seawater from the Tyrrhenian Sea off the coast of Amalfi, where the dish originated. So to give his whole snapper a sense of authenticity, chef Ruben Martinez uses filtered seawater (note that word filtered) from Cronulla Beach, adding cherry tomatoes, wine and herbs. Served with a branch of lemon leaves complete with lemon, it's a beautiful thing. The seawater isn't the only local ingredient at the new Giro Osteria, which spills onto the forecourt at the sandy end of Kingsway. 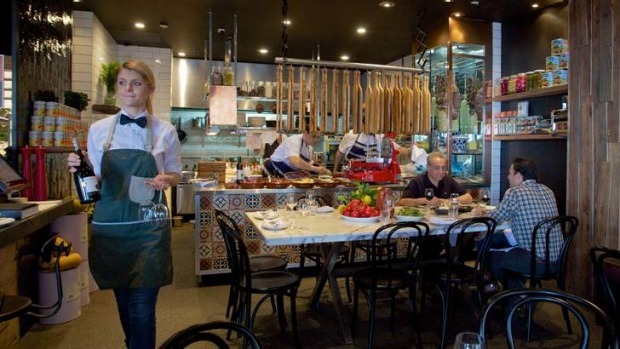 The salumi comes from Pino's Dolce Vita in nearby Kogarah, and the sourdough bread for the bruschetta is baked by Nick Tabet of the Alley Break Cafe, two doors up. The most local ingredients here, however, are the diners, with many on their second or third visits already. They must be feeling blessed. First, the popular Alphabet St Thai popped up late last year, from former Rambutan owner Joe Natale. Now, Natale and partner, Oriana De Luca have reeled in Martinez from Woollahra's La Scala on Jersey to open Giro practically next door. Seawater notwithstanding, a lot of current trends have been cleverly synthesised into one happy, high-energy package. There are shades of Cafe Sopra and Fratelli Paradiso in the walls of chalked-up menus; a prop-and-perch stool-lined counter reminiscent of Popolo; and a vertical wall of hanging wooden boards straight out of Jamie's Italian in the UK. Yet it all comes together to create something new that feels right for its time and place. Order salumi (3 for $18) and nutty prosciutto di Parma is finely sliced to order on the gleaming Ferrari-red slicer, and teamed with rockmelon; wafer-thin slices of a lovely finocchiona salami come with pickled fennel; and a chunk of house-made Bangalow pork terrine - almost a pork ragu in aspic - is boosted with a dense, sticky prune relish. Along with salt-crusted bread, it's a classy, generous start, cheekily served Jamie-style on one of those long boards, propped on cans of Italian tomatoes. Add bruschetta ($6) for a rich crunch on the side topped with baccala mantecato (salt cod puree) and zingy red pepper relish. A mainly Italian and mainly natural wine list runs from Prosecco to a heavy-hitting Paradiso di Frassina Brunello ($160). Further down the reality end of the list, a fleshy, velvety Zenato Valpolicella ($52) works hard for the money. That fish in crazy water ($36) is one of the best I've had outside Italy; the snapper meaty-sweet and not over-cooked, and the juices like a light spring broth with acid-bombs of truss tomatoes. Another good bet is the agnello del giorno ($32), today, long-boned lamb rib chops charred on a strong grill and served with roast pumpkin (deep, dense, sweet) and a wilted toss of cavolo nero and broccolini. Side dishes are worth considering, especially new season asparagus on white bean puree ($8). It's worth noting that I failed rather spectacularly to order Giro's most popular dishes; the gigantic bistecca Fiorentina for two, and the spaghetti con granchio with king crab, but I prefer to think of this as a clever way to give me reason to return. In keeping with the osteria philosophy, desserts are kept simple - panna cotta, cannoli, and a pillowy little rum baba ($14), the rum-soaked brioche soft, light and boozy without the usual cloying sweetness. It's almost ridiculous how many new Italians have opened this year, but Giro stands out by getting so many things right, from its cheery, generous hospitality to its sophisticatedly simple cooking and quality of care. It's places like this that are turning Cronulla into a destination for dining, and not just eating and drinking. Best bit It's welcoming, warm and local. Go-to dish Pesce all'acqua pazza, $36.